Designed for English-speaking students ready to embark on the adventure of learning Mandarin Chinese, Encounters accelerates proficiency and cultural understanding through authentic language and cultural experiences. This fully integrated program includes combined textbook/workbook student editions, audio and video instruction, online workbooks, and a comprehensive website with extensive educational resources. 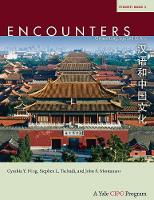 The communicative approach of Encounters immerses learners in the Chinese-speaking world through dynamic videos that correspond to units in each textbook. By combining a compelling story line with a wealth of educational materials, Encounters weaves a tapestry of Chinese language and culture. Cynthia Y. Ning is associate director of the Center for Chinese Studies and U.S. director of the Confucius Institute of the University of Hawai‘i at Manoa. She is the former president and executive director of the Chinese Language Teachers Association. Stephen L. Tschudi is a specialist in technology for language education at the University of Hawai‘i at Manoa. He develops distance education applications for Chinese language at all levels. John S. Montanaro recently retired as senior lecturer in Chinese at Yale University, where he taught for more than thirty years.